While frogs are happy to pass the winter at the bottom of a pond, toads are terrestrial hibernators: they'll dig deep into soft garden soil, beneath the frost line, to spend the long, freezing months in dormancy. To make your backyard even more amphibian friendly, dig a hibernaculum (a place to hibernate) for toads. • Excavate a hole at least 1 m square x 1 m deep. • Fill the entire hole with soft sand. • You can cover the surface with compost to keep the hibernaculum warmer and give overwintering toads additional protection from freezing temperatures. • To learn about composting methods that work well in conjunction with this project, see "Compost Leaves for Your Backyard Habitat" or "Compost Your Garbage." Follow the maintenance guidelines in the aforementioned composting projects. 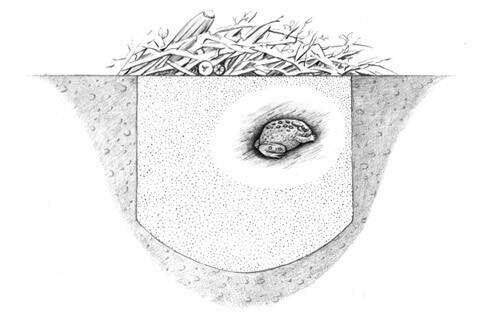 The hibernaculum itself is maintenance-free.